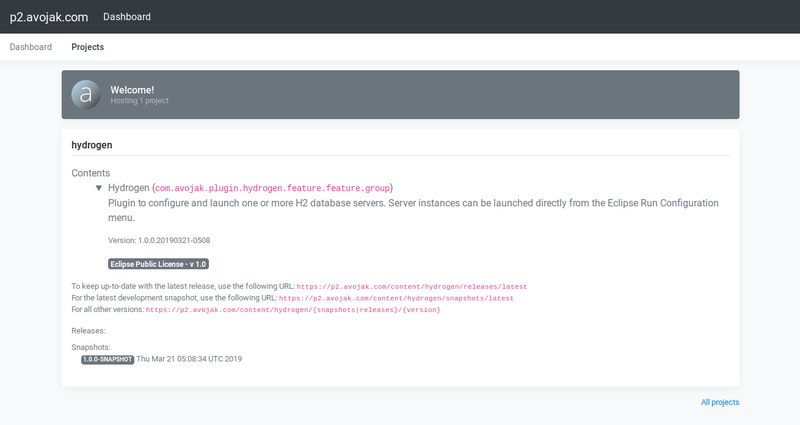 AWS p2 Repository is a web application to host p2 repositories backed by AWS S3. I promise that this is the latest project related to AWS and p2 for a while! This got me thinking - it would also be nice to provide a site to view all available software hosted on the bucket. When you visit https://p2.avojak.com, you would expect to see all content hosted there. I ultimately decided to play around with Spring Boot to create a web application that would serve up content hosted in an S3 bucket. The web application would be able to take requests for /latest (or a particular version), inpsect the bucket content, and return the content that is the latest version available. Furthermore, it would be simple to add a minimal UI with Thymeleaf to view the bucket content. If the version URL parameter matches "latest", I simply lookup the most recent version for the qualifier ("snapshots" or "releases"), and proceed with a discrete version. ...and that's just for ONE SNAPSHOT version! You can see how quickly that list of keys can grow. That poses a bit of a challenge when we want to determine a simple list of projects and available versions. And that's it! This is based on the assumption that a valid p2 repository will necessarily contain a p2.index file, which is used by Eclipse to locate the repository content (the content and artifacts archives). Perfect - one key per version per project! Now by simply dropping the /p2.index from the key, we have a key prefix to locate all content for that project version. To retrieve repository metadata I leveraged my previous project (p2-inspector) to query the p2 repository. I had used Spring Boot and the AWS SDK before working on this project, however Thymeleaf was completely new to me. This was a bit of a nusance, although once I figured out how to create reusable partials, my UI templates got a bit cleaner. I'm still not completely happy with my templates, as there is a lot of logic performed in the template (e.g. conditionally displaying messages for no content). Ideally, this would all be performed server-side and the UI would be "dumb". The one key feature that I did not implement, but would be nice to have, is the ability to upload repositories via the web dashboard. There's an issue for it in GitHub, so maybe at some point I'll tackle it. 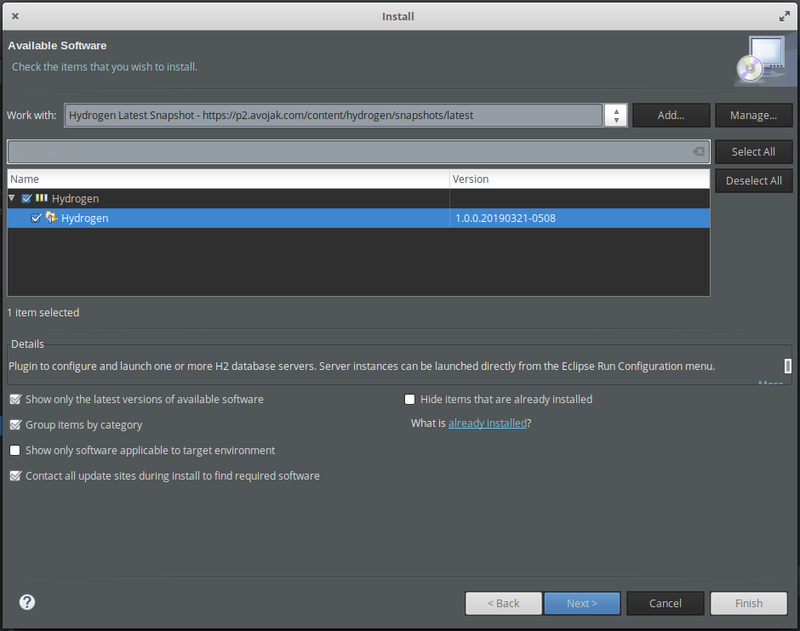 Hydrogen is plugin for the Eclipse IDE to configure and launch one or more H2 database servers.